Tributes have been paid to the comedy actor Bella Emberg, who has died aged 80. Emberg was described by Russ Abbot, with whom she appeared on The Russ Abbot Show as Blunderwoman, as a“a woman of immense warmth and generosity”. During a television career spanning six decades, Emberg appeared in programmes including The Benny Hill Show, Doctor Who and Z Cars. She had recently finished filming In The Long Run, a Sky One comedy created by Idris Elba, the BBC said. However, she will be best remembered for her turn as Blunderwoman, the comic sidekick of Abbot’s Cooperman in the 1980s. Les Dennis, who appeared on The Russ Abbot Show, shared a photo of him and Emberg on Twitter. 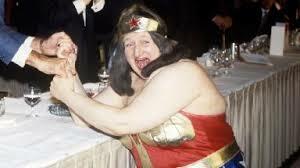 So sad to lose the lovely Bella Emberg. A funny, lovely friend. Thoughts and love with Rosemary. Goodnight Sweetheart x.